Welcome to Old Brewery Antiques. You are now under the antique coins and paper money page. For all vintage collectors or just someone who is fond of collection something as his personal hobby and pastime, antique coins is one great thing to collect. In fact, it may not be surprising to you to have heard of stories about collectors who have traveled in different continents just to find the piece of coin that will complete their most valued collections. Even some are eager to pay that much, in order to own that specific antique coin, since he knows that it is very rare, or can be impossible already, to find another piece of it somewhere. Old Brewery Antiques offers antique coins, from different eras, and from different countries. 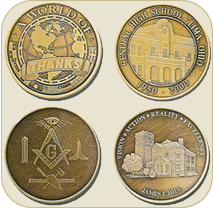 You can find here ancient coins from different places such as Canada, Iowa, Germany, US, Japan, and others. You can also find here coins that have existed as early as the 18th century, and some can be older than that. Each comes in different prices and quantity, depending on the seller, and also on bids and negotiations. Aside from antique coins, you can also find here antique paper money from different countries and eras. You can look around and see if something here that can complete your collection. Moreover, you can also find here other collectibles which are very interesting and of great value as well; and may it be just for your personal collection or as an investment in the future, you can find the perfect item to complete your most treasured valuables here. Just a friendly reminder, in purchasing antiques, just be careful and keen enough so you won’t be deceived by the fake ones.